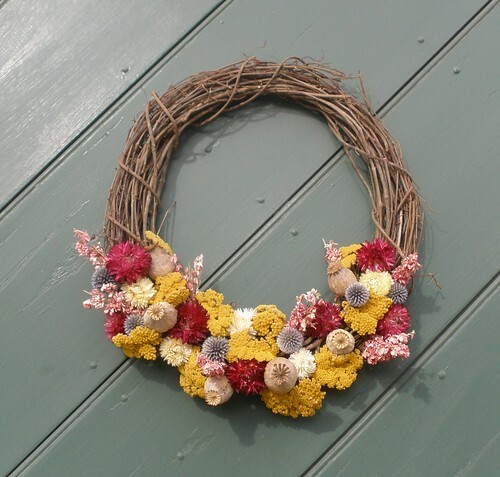 A pretty wreath can be created from vines. Various vines will work, but be sure that you don’t use poison ivy vine. Remember that poison ivy vine is hairy. If it is hairy, be wary and don’t use. If you have your own property or have a friend with a property that has wild grape vines growing on it, you will have no problem making wreaths. Grape vines can be a very economical way of making wreaths for the holiday season, wreaths that will last a long time. Other vines can be used as well. You can use bittersweet vines or the kudzu vines. Any vine that doesn’t cause you to itch can be used. If you don’t have a place where you can pull out the vines, you can probably buy these vines at a farmer’s market. See if someone sells them made from vines on their own property. These wreaths made out of vines should be cheaper than other wreaths. When you pull down these vines, you are helping the trees that these vines encircle. These vines strangle the trees or shrubs that they entwine. Both the kudzu vine and the Asian bittersweet vine are particularly pernicious vines that one wants to cut down. This YouTube video shows you how you can pull down the long grape vines in the woods and make a simple wreath.